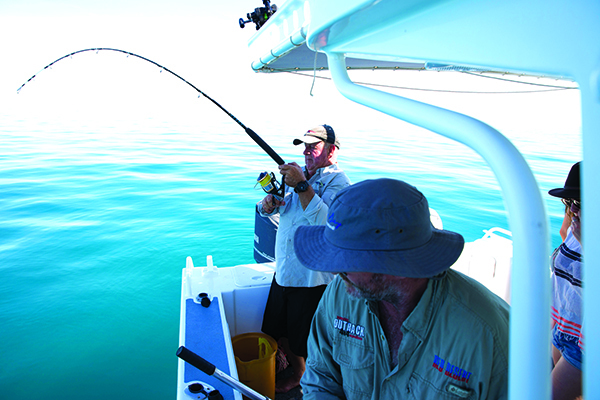 Everything you need to know about catching and cooking a barramundi. Barramundi or ‘barra’ are more dinky-di than a kangaroo drinking a Coopers green at the V8 Supercars. That wasn’t always the case though. Prior to the ‘80s they were known in Australia as Asian sea bass. The marketing department was given the assignment of coming up with something cooler, and landed on barramundi, which is an Aboriginal word meaning ‘large scale river fish’. 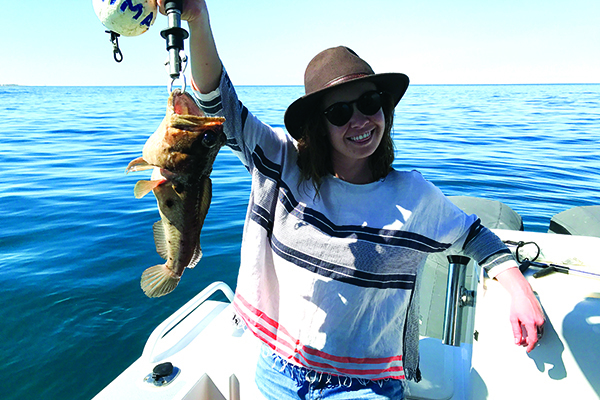 These days’ punters travel from far and wide to catch the iconic Aussie fish. For good reason too - barra look great, taste great and fight like feral cats on roller skates. Barra inhabit the warmer waters around the top of Australia. They’re particularly prevalent around the Kimberley region, where you’ll find lots of tidal rivers, and not many people. Barra are great fun to target on lures because they will eat anything, even if it’s 60% of their own length! They’re also hermaphrodites and will switch their boy bits to lady lumps when they reach around 80cm in length. There’s a lot of contention around saltwater barramundi tasting better than freshwater barramundi. Some say freshwater barra taste like a mouthful of mud, while others can’t notice any difference at all. In my opinion, saltwater fish are much better on the fang, but a freshwater fish from an estuary ain’t too bad either. It’s really just the landlocked fish you want to stay away from. 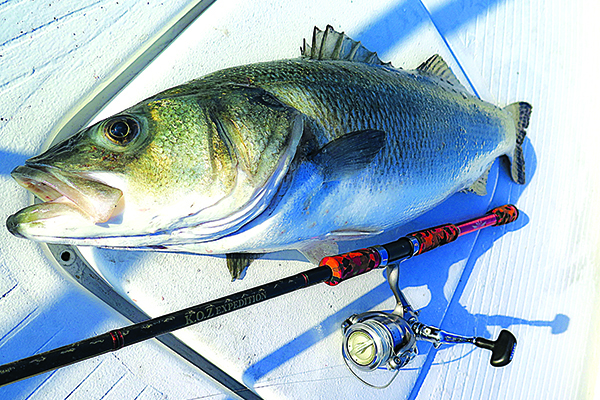 Here’s where it gets tricky… saltwater barra can be caught in freshwater and vice versa. You can always pick a saltwater fish by their shiny chrome flanks and yellow tails. Freshwater fish are much darker and can be anything from gold to olive, and sometimes completely brown. 3. Keep your eyes peeled for crocodiles. They’re hunting barra too. Multiple crocs congregating around sandspits or edges are a sure sign of barra en masse. 5. You can never retrieve a barra lure too slowly. Keep it in the strike zone as long as possible, using intermittent twitches to entice a bite. 1. Gold Bomber: like a 4am kebab to a big barra. 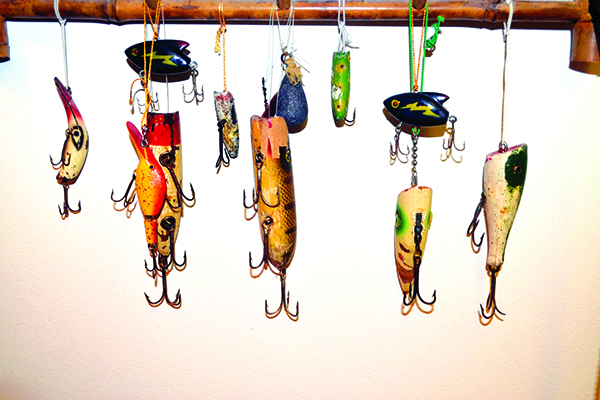 Some blokes I know only fish these lures in three patterns. 1) Worn out with no colour left, 2) close to worn out with a few gold flecks left and 3) still in packet. 2. ZMan 4” Minnow: if you want quantity over quality, these soft plastic are the go. They’ll catch a lot of barra, and all you need to do is cast them and let them sink before slowly retrieving. Rig them weedless for maximum effect. 3. Barra Classic: a great hard-bodied lure with a big bib on the front. Under expert guidance a classic can be twitched and it'll park itself back in the same spot. It's perfect for spending time in the strike zone. So you’ve bagged your barra and you’re ready to start cooking it over the campfire. Here’s bangin’ barra recipe. Start a campfire and let it burn down to coals. While waiting, combine all marinate ingredients in a bowl. Gut and scale the barramundi, then score along each side with three incisions, approximately halfway towards the spine. Tear off two sections of heavy-duty aluminum foil big enough to completely wrap around the barramundi. Double the layers over each other for extra strength, then spray the inside with cooking oil before placing the fish into it. Turn up the edges of the aluminum foil to create a lip or bowl type effect. Season both sides of the fish with salt and pepper and add marinade all over the fish, particularly around the incisions. Add a few wedges of lemon and half a diced brown onion too – this will stop the fish from drying out. Seal up the aluminum foil around the fish and place onto a bed of coals about 5cm thick. 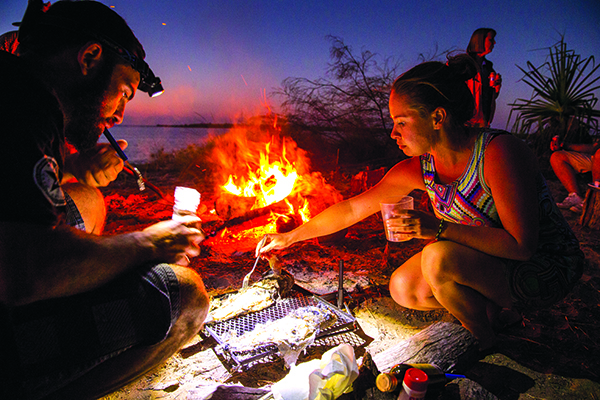 Cooking times will depend on how hot the coals are, and how big the barramundi is. This can vary from 15-30 minutes. It’s vital you don’t overcook the fish so check it every 10 minutes. The barramundi will be tender to touch and its eyes will be a pearl white when ready. The flesh should also be white and flake away from the bones easily. If it’s tough and translucent, wrap it up again and pop back into the coals. When cooked, garnish with coriander and eat straight out of the aluminum foil for real bush tucker effect.